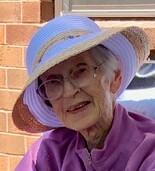 Rosalie M. Meehan peacefully passed away on 11 February 2019 with family by her side. She was born on 1 June 1923 and, except for nursing school and her first employment, she lived her entire life in Pawtucket in the house built by her grandfather. She was the wife of the late Leo J. Meehan and the daughter of the late Leo A. Dolan and Sarah C. (Menagh) Dolan. Rose graduated from Pawtucket East (Tolman) High School, attended Pembroke College and graduated as a Registered Nurse from the Boston City Hospital School of Nursing. She served at the Veterans Administration Hospital in Bedford, MA and Memorial Hospital in Pawtucket, R.I.
She is survived by her children Kathleen Meehan (Avelino Tamayo), Kevin J. Meehan, Ellen M. Kerber, Eileen M. Wilmarth (David Wilmarth), Michael E. Meehan and Mary L. Hill (Peter Hill). She is also survived by her grandchildren Timothy Wilmarth (Kara), Cara Kotsiris (Bill), Alex Kerber, Alana Kerber, Jonathan Newberg, Michael Hill, Katherine Hill; great-grandchildren Neala Wilmarth, Nicholas Kotsiris, Georgia Kotsiris and nieces and nephews Maureen, Owen, Patrick, Catherine, Anne, John, Joseph and Michael, children of her late brother and sister-in-law, Owen and Margaret Dolan. Funeral services will be private. Rose would have been delighted if anyone wishing to make a donation in her memory would consider the Pawtucket Skilled Nursing Center (ATTN: Activities Fund), 70 Gill Ave., Pawtucket, R.I. 02861 as thanks to the staff and residents who provided her with wonderful care and friendship.